If strength, mobility, and/or balance are issues, these chair exercises are a great way to improve fitness! As individuals age, exercise can become more challenging or intimidating for fear of getting hurt or falling down. Luckily, the emergence of chair exercises for seniors is becoming increasingly popular. 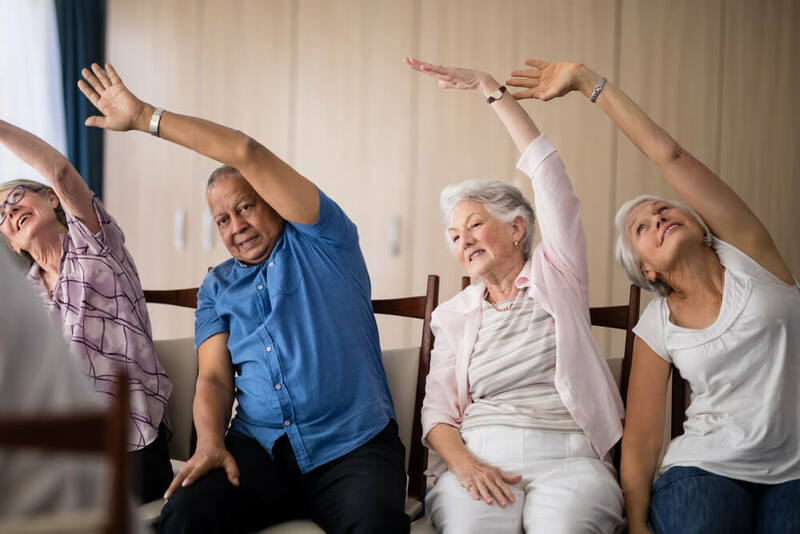 People are who are trained in yoga can also be trained in chair yoga as well as have an understanding of low impact chair workout for seniors and exercises. Trying out chair exercises can be easy and not only help those who have knee pain but also those who have difficulty standing or balancing. Here are a few of our favorite ideas for chair exercise for seniors. Click here for more low impact indoor exercises. Ensure legs are at a 90- degree angle with the knees over the ankles. Leave a space between your knees that could fit a fist. While taking a deep breath, exhale and roll shoulders down the back while pulling the bellybutton inward towards the spine. Once the spine is fully extended, allow the torso to fold over the legs. This can start by allowing the hands to rest on the thighs and slide them down the legs. Chair exercises for seniors are a great way to get low impact exercise while keeping the body moving. It can be a mixture of cardio and yoga to both help the body stretch and gain strength. Before really getting into chair exercises, it’s a good idea to speak to a medical professional to see if they have any advice or warnings for what is right for you.